The quality, durability and performance of Highland embroidery machines and chenille machines is evident in our unbeatable five year warranty. We stand behind every machine we sell. This warranty applies to all new Highland embroidery machines and Highland chenille machines sold by MESA or a MESA authorized dealer. The RPS Reciprocator is covered for the lifetime of the machine. Drive Train Components including Bushings, Bearings, Cams, Gears, Pulleys, Sprockets, Belts, Chains, Shafts, Drive Cables, and Frame Drive Rails. Electrical Components including Wiring Harnesses/Cables, Motors, Solenoids, Switches, Sensors, Rotary Encoders, Fans, Noise Filters, Transformers, Light Fixtures, Printed Circuit Boards/Cards, Controller, Disk Drives, Rotary Encoders, and Potentiometers. 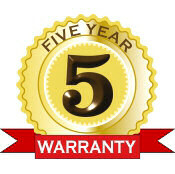 This warranty covers defects encountered during normal use and does not apply to damage or failure due to: abuse, misuse, neglect, accidental damage, or acts of God, failure to follow the operating and maintenance instructions provided, improper maintenance or lubrication, improper adjustments or modifications to the machine, the installation or use of non-approved parts or accessories. This warranty does not apply to: consumable and/or expendable components, including, but not limited to needles, bobbin cases, bulbs, fuses, air filters, needle bar reciprocators, plastic spiral bevel gears, etc. ; losses or damage to goods, or other property damage arising out of the use, misuse, or inability to use the machine; shipping of warranty parts; travel expenses incurred while providing services pursuant to this warranty. This warranty is void if anyone other than MESA Supplies, Inc. or one of its authorized dealers attempts to repair or modify the Machine without the permission of MESA Supplies, Inc. This warranty is void if unapproved parts or accessories are used in conjunction with your Machine.